The Orach plant is part of the Atriplex species and is also known as a “saltbush.” It grows in salty soil on coastlines and can be found in Northeast Asia, the Middle East, North America, Southern Europe, and North Africa. The plant usually grows three to four feet tall and has leaves which grow up to two inches in length. The Red Orach is the most commonly eaten cultivar. It is an annual, cool season leaf vegetable. Young leaves may be harvested from late spring through fall, and the plants will continue growing for multiple harvests. It is referred to as French Spinach and was grown in Mediterranean regions until spinach became the more favored vegetable. Orach has a mild chard-like flavor but tastes saltier than most greens as the minerals from the soil are stored in the plant’s leaves. Orach leaves are used cold or cooked, and can be used like spinach or chard, or stuffed like cabbage leaves. 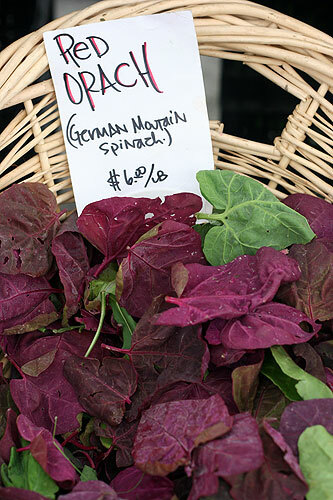 When purchasing orach, look for tender, young leaves with a ruby red sheen when you hold them to the sun.